I am someone who really dislikes meal planning. I do look forward to holiday meals or special occasion dinners but for the day to day meal planning I hate it. Enter Pinterest! Wow! My meal planning interest has increased with Pinterest. There are so many mouth watering meal temptations! My most favorite Christmas gift this past year has been a fondue pot. How in the world have I lived so long without one in my possession? is a question I ask myself every time I use it. Well, let's just say it's a lot. Also, I do not need a special occasion to use my fondue pot. It's just special enough to use on any occasion. Wow! This was a most delicious feast! With two kids I always do my best to have fresh veggies available at every meal. So, in addition to the bread we also had carrots, broccoli, par boiled fingerling potatoes, and red bell peppers to dip in the cheese sauce. Let's be honest, put cheese on anything and it's delicious! The actual sauce was mild in flavor due to only using mozzarella & parmesan cheeses but the basil and nuts really give this fondue an incredibly delicious taste that is not too rich! 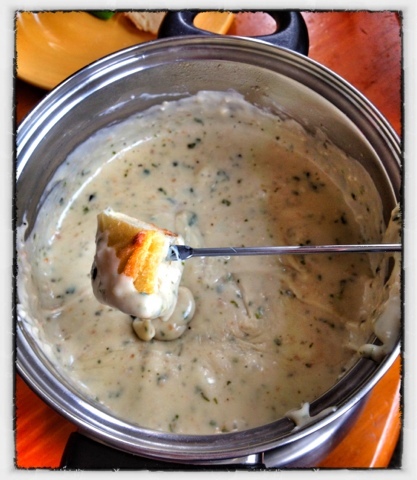 One of the best fondue's ever!